Update December 4, 2016: G2A Direct is off to a strong start, having signed up 50 developers in the four months since its announcement, with more in the pipeline. G2A, the digital marketplace for videogame keys, have apparently been taken aback by the popularity of G2A Direct, the developer partnership scheme they announced at the end of July. After cheap games? How about nothing at all? Here are the best free games we’ve ever played. Studios that have so far signed up with G2A Direct include the SuperHOT team; Hi-Rez, who make Paladins, Tribes: Ascend and Smite; and Playrise Digital, makers of Table Top Racing. Other software developers include What The Fast, a US company that facilitates low-ping services for shooter fans. Talks are ongoing with other devs, Mirek says, so expect more partnership announcements “in the coming months” as G2A streamlines its onboarding processes. Besides setting out the success of the scheme so far, Mirek’s talk highlighted its key selling points. These were outlined in the initial announcement (see below), but most notably include an 89/11 revenue split between developers and G2A (Steam offers 70/30); up to 10% payments on top of third-party sales (something “no one has done before” according to Mirek); and support from G2A with marketing and promotion. Membership of the scheme is free; all the developer has to do “is basically decide to join”. Mirek concluded by mentioning one last feature: the ability for developers to query keys listed on the marketplace which they suspect of having been obtained fraudulently. G2A are no doubt hoping that moves such as this will restore customer faith in their marketplace after a particularly nasty listing of fraudulent keys earlier this summer earned them a truckload of bad publicity. We’ll have more on what else G2A are doing in this regard over the next few days, but in the meantime, what do you make of this rush of developers to G2A Direct? 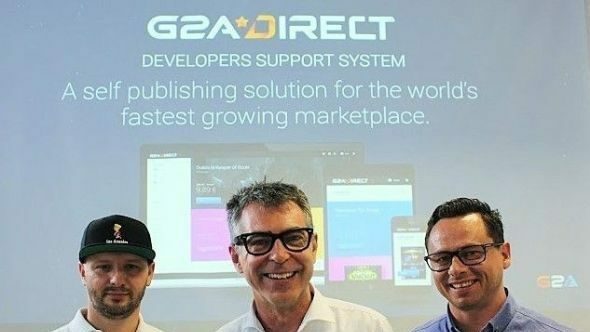 Original story July 29, 2016:As part of their announcements last month that they would be working more closely with developers, G2A have now launched their official partnership scheme. This allows devs to shack up with G2A to sell games on their service, and provides a number of other benefits – such as the promised10% G2A marketplace royaltyoption on third-party sales, and access to G2A’s backend to query game codes and combat fraud. “Revenue share from sales of game codes sold via G2A Direct is 89.2% to the developer or publisher and 10.8% to G2A.” Last we heard, Valve’s split was 70% to devs, 30% to them. “A Developer Fee of between 0% and 10% can be applied on your games listed in third party auctions.” This means developers can receive revenue from second hand sales via the G2A marketplace. “The ability to query game codes in [the G2A] database.” This is part of G2A’s new anti-fraud measures, allowing developers to see if certain codes they know were fraudulently obtained are being sold. “A donate facility” This places a donate to developer button on product pages. “Free translation services for product page information” similar to Steam’s Translation Service. That last is fairly interesting. It’s always assumed that a lot of these sites are kept afloat by teenagers with lower disposable income, combined with the site’s skin trading section drawing in the famously younger CS:GO crowd. Seeing it as an actual selling point for their service is a different angle. Developers who are interested are advised to email [email protected] As buyers, how do the changes G2A have made affect your opinion of them? The backlash towards the company after the various allegations by TinyBuild was extreme – is that still how gaming communities feel?